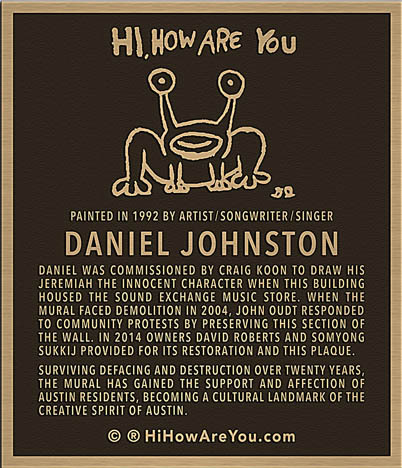 Daniel Johnston ART EXHIBIT in Paris April 22 - May 7 "Welcome To My World"
AUSTIN MURAL to receive a FACELIFT and a BRASS PLAQUE! Restoration work on Daniel Johnston's MURAL in Austin Texas (at 21st and Guadalupe) has received repeated set-backs from various vandals. Restoration should be completed this month, and the mural will be COATED with a protective coating to deter future vandalism. In addition, a BRASS PLAQUE will mark the wall, hopefully identifying it as an important piece of art, and a landmark in Austin.